A heroine is defined in the dictionary as a woman who is well-known for courage and daring action. It's further described as someone who is noted for a famous achievement in a particular field or situation. In our Christian faith, we come across stories of women whose testimonies and actions have radiated Christ in their own lives and have inspired others to see that Light as well. The beauty is that these faith heroines point us to Christ and encourage us to live a life worthy of the calling we have received. 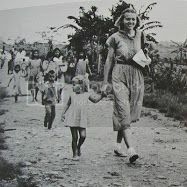 Elisabeth Howard, the sixth child in a missionary family, was born on December 21, 1926 in Belgium. When she was only four months old the family moved to Pennsylvania. Elisabeth grew up in the United States living in New Hampshire, Pennsylvania, and New Jersey. Elisabeth decided that it was her calling to translate the New Testament into an unknown language. To acomplish this task she studied Classical Greek at Wheaton College. While studying at Wheaton she met Jim Elliot. After college she studied further at the Prairie Bible Institute in Alberta, Canada. After all her studies, she and Jim Elliot went separately to Ecuador to work with the Quechua Indians. Jim and Elisabeth were married in 1953 in the city of Quito, Ecuador. Two years later the missionary couple had a baby girl, Valerie. Jim Elliot wanted to reach a people called the Waodani. He began preparing to make contact while working with the Quechua Indians with Elisabeth. The first contact with the Waodani was made from their airplane using a loudspeaker and a basket to pass down gifts. Months later, Jim and his team decided to set up a base a short distance from the Indian village, along the Curaray River. One day a small group of Waodani approached their base showing their interest in the missionaries. The team gave one curious Waodani, nicknamed George (his real name was Naenkiwi) a plane ride. Things were looking good! The team began plans to visit the Waodani. Little did they know that "George" had lied to the other Waodani about the missionaries' intentions. Before the team could visit the Waodani, a large group of Waondani warriors came to their base. The warriors killed Jim and his team, leaving Elisabeth and her 10-month-old baby girl alone on January 8, 1956. Rather than give up on her husband's work after his death, Elisabeth continued the work with the Quechua for two years. Two Waodani women living among the Quechua taught Elisabeth the tribal language. In October 1958, she went to live with the Waodani with her then three-year-old daughter. There Elisabeth was known by her tribal name Gikari, which meant "Woodpecker." She later returned to the Quechua and worked with them until 1963, when she and Valerie returned to the US where they lived in Franconia, New Hampshire. Elisabeth Elliot has lived in the US since then. In 1969, Elisabeth married Addison Leitch professor of theology at Gordon-Conwell Theological Seminary in South Hamilton, Massachusetts, but he passed away in 1973. Then, in 1977, she married Lars Gren, a hospital chaplain. 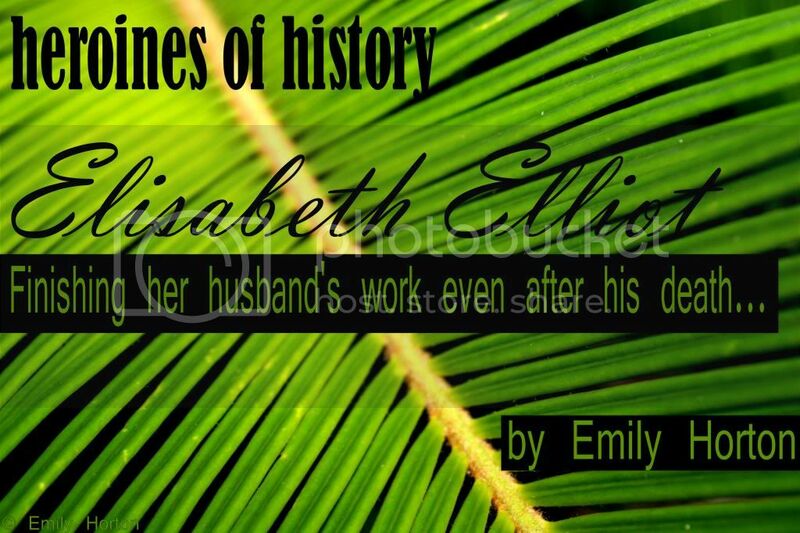 Elisabeth served as one of the stylistic consultants for the committee of the New International Version of the Bible (NIV). Elisabeth has continued to served and be an example of Christ through the present years working with colleges and through radio programs. She and her husband Lars continued to travel and spread the Good News. You can take a look at what this heroine, who has left her mark on history, is doing via her website: www.elisabethelliot.org. You may also want to read one of over twenty books she has written, including, Through Gates of Splendor, which tells the real life accounts of her missionary life in Ecuador. This is so cool!! I was just thinking about her yesterday (I didn't see this post) because someone I knew had a book she wrote and she said it was very good. I plan to get a lot of her books shortly! This lady has really been used of God in my life. So grateful for her willingness to love and serve and live out the Gospel!